When the whole "reality TV" craze began several years ago, I prided myself that I never watched reality TV. Then Ned started telling me how good Survivor was and week after week would say "you really need to be watching Survivor, Mom." So at some point, somewhere in the second season, I turned it on to see what all the fuss was about. Surprise, surprise. I actually liked it. So I became a Survivor fan. In truth, I didn't watch all of the early series, but I've been fairly faithful for the last several years. So much so that I recognized the "favorite" in the recent "fans vs. favorites" series and had my favorites even before the show started. Of course, Yau Man, perhaps one of the smartest players, was eliminated early, but by then I was hooked yet again. I have to admit that I expected Amber to win it all and was surprised when Parvati took home the $1 million. But since by the time the final show aired, I couldn't tell the two apart, I didn't really care which of the two won. Once I became hooked on one reality show, I began testing the waters with others. We discovered The Amazing Race and it remains my very favorite of the reality shows. Sometimes it's better than others, some contestants are less likeable than others, but I love the look at trying to get around the world and all the adventures they have. Two of Char's daughters have been trying to get on the show and would be absolutely GREAT on it....anybody who can travel with their parents for as many years as they did (Adventures with Char and Mike would make a great comedy series!) would be prime candidates. I avoid all the mating-and-dating reality shows like the plague, but I watched the odious Apprentice for a couple of seasons. The longer I watched the more I hated Trump and the kvetching and back stabbing just turned me off. I had absolutely zero interest in watching the recent star-studded version, especially since Trump was bringing back Omaroso, my least favorite candidate of all time. My CompuServe group were all agog about Dancing with the Stars, which I never ever thought I would enjoy, but I tuned in just so I could follow the discussion. I've watched for several seasons now and still very much enjoy it. This season it's down to the last three and I'm torn between hoping that Kristi Yamaguchi or Christian de la Fuente will take home the mirror ball trophy. Christian has accomplished incredible dancing feats given that he injured his arm two weeks ago and has postponed surgery until the competition ends. But Kristi has given the most consistently impressive performance and it's time for a woman to win anyway. What I most love about the show is the support that all the contestants have for each other. You won't find any backstabbing or trash talking on this show! Then Bravo found a goldmine in reality shows. It was inevitable that I would watch Top Chef, being someone who enjoys cooking. The thing I hate most about this show is that they are all so angry with each other all the time. This season seems particularly negative and the language appalling. But I love watching them in the kitchen. I love seeing them buy a few ingredients and then turn out this amazing gourmet things that would hever have occurred to me in a gazillion years (not to say that most of the ingredients are things that I probably wouldn't think of eating). My friend Bill thinks that there is a bias against women on the part of head chef Tom Colicchio. Maybe I don't watch carefully enough, but I hadn't picked up on that. I rarely have a favorite on this show. I only watch it for the cooking techniques. I half heartedly watched at Shear Genius, a competition for hair dressers. Like Project Runway, I didn't care about hair styles or anything else, but it was fun for awhile. And I recently discovered Animal Planet's Groomer Has It, in which 12 contestants vie to be top dog groomer. This is Shear Genius meets Project Runway with 1/10th of the budget. Tacky, Tacky...lots of back stabbing, but fun to see the animals. I've only seen it twice. The jury is still out on it. I loved the two versions of The Next Food Network Star. I learned a lot about how The Food Network works, got to see some of the Food Network regulars interact with the contestants. I also loved what appears to have been a one-shot Next Animal Planet Star (or something like that). It was great fun seeing what goes into the making of an Animal Planet show and how people are groomed to appear on camera with live, unpredictable animals. Then, of course, there is the ever-popular American Idol. A show I never in my wildest dreams imagined I'd watch, but everyone talks about it. There are news reports on it, articles about it, jokes about it on talk shows. 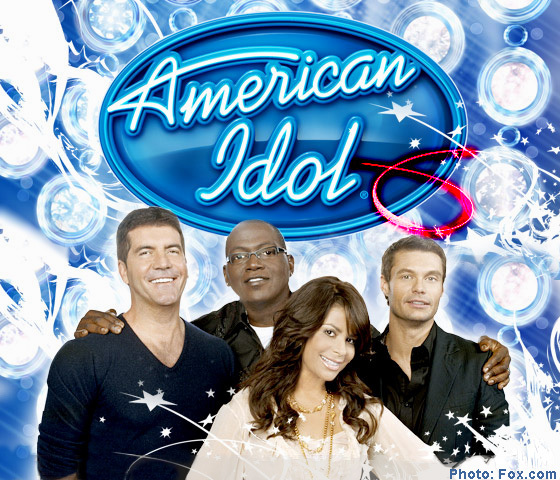 If I was going to be a real televisionaholic, it seemed that I had to check out American Idol. It's one of those shows that I don't understand why it hooks me, but it has for the past several versions. I have enjoyed it this time around, though people say that its popularity is waning. I did predict that the final two would be the two Davids and as much as I like cute little David Archuletta, David Cook, whose music I would never listen to (while I would listen to Archuletta), I think he just "is" the essence of an American Idol. So my prediction is that David Cook is going to be the next American Idol. So it's all Ned's fault. If he hadn't encouraged me to watch Survivor I might never gotten hooked on the whole reality TV thing. Fortunately there are an awful lot of reality TV shows out there that I have never watched and will never watch--but I am surprised to realize how many I actually do watch!